So sorry for the late posting of this entry since I am waiting for the pictures to be uploaded on our LAN here in the office. The pictures came from the programmers who are armed with their DSLR cameras to capture the event. 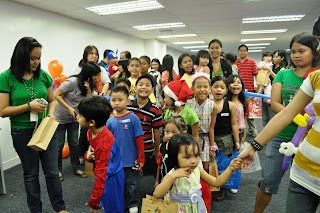 Last Friday, December 11 we held our Kiddie Christmas Party for the daughters, sons, nieces, nephews and cousins of our company's employees. Some came in costumes while other are just comfortable with their casual outfits. 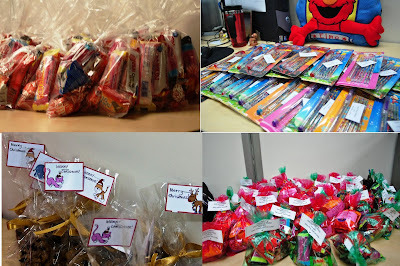 Lots of treats for the children! The host magician of the party doing tricks for the kids. Kids and adults alike are hungry since they all participated in the games. It was a fun-filled day and I enjoyed watching the kids played games. 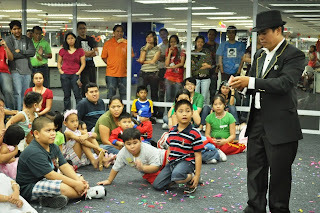 Surprisingly I also like the magic show when the host asked the children to participate in every tricks. Someday I will be able to experience the feeling of being a parent and I have a hunch that I will be a stage parent like some of them...hehehehehe. That looks like a really wonderful time. Whenever children have fun, adults have fun too. A party for the kids is a party for mom and dad too. Have a blessed Christmas!